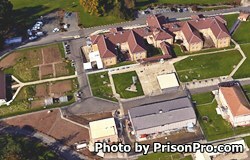 Santiam Correctional Institution is a minimum security prison located in Salem Oregon that houses over 440 offenders. Originally this building was used as an annex for the Oregon State Hospital and treated mentally ill patients. Offenders at Santiam are provided a variety of work assignments and are allowed to work on crews that provide labor to various government agencies. Inmates can receive pre-release transitional programs to help prepare them for their discharge. Religious worship services are offered to all inmate's through the Chaplains office. Inmates are also provided necessary dental, medical and mental health treatment during their incarceration. Additionally, offenders who suffer from drug and alcohol dependencies can receive substance abuse treatment. Visitation at Santiam Correctional Institution occurs on Mondays, and Fridays from 6pm-9:15pm and on Saturdays, Sundays and Holidays from 12:45pm-3:15pm, and from 6pm-9:15pm. Processing of visitors ends 30 minutes prior to the end of the visiting session. Santiam Correctional Institution also offers enhanced family visiting, contact the facility for more details.